to my collection of English tea mugs. The delicious macarons are from Trader Joe's frozen food section. Word Search in a teapot themed gift bag. Great mug, and those macarons look delicious. I love your mug and your clever gift ideas for the Royal Wedding tea guests! I'm sure you must have told us before, Linda,dear, but where did you get your Royal Commemorative mug? 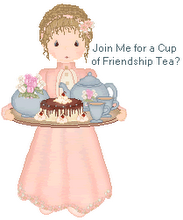 Fun commemorative mug and favors for your tea party guests. Teresa pulled out all the stops for a tea during our Southern Tea Time Getaway. I haven't blogged about it yet as I'm doing the trip in sequence, but her tea party will be posted eventually.